The programme got me thinking about the ways in which cultural memory can lionize certain individuals, to the point where the reality of their lives is buried beneath a kind of mythology produced by the cultural and social mores of a succeeding period. A literary case in point is Charlotte Brontë, whose life and legacy were constructed according to very particular Victorian-era strictures on female behaviour by her first biographer, Elizabeth Gaskell. The resulting image of Brontë held wide sway throughout the Victorian period and into the twentieth century, with readers regularly making pilgrimages to Brontë country to pay homage to an author about whom they had only vaguely realistic ideas and perceptions. The same might be said about many of our so-called ‘canonical’ writers, as well as famed historical figures. While we might argue that the contemporary context of such figures is central to an understanding of their actions, it seems equally essential that we acknowledge the context in which scholarship and historiography are produced. This would help explain why certain individuals and texts receive an inordinate amount of critical attention, while others remain marginalized. Much Irish Gothic fiction of the late eighteenth and early nineteenth centuries, for instance, has suffered at the hands of the canonization of English writers like Horace Walpole, Ann Radcliffe and Matthew Lewis, to the point where it often seems as if Irish writers simply didn’t engage with the Gothic aesthetic at all in this period. That this is patently untrue is clear from the litany of Gothic novels produced by Irish pens in the latter half of the eighteenth century alone: The Adventures of Miss Sophia Berkley (1760), Longsword (1762), The History of Lady Barton (1771), Earl Strongbow (1789), The Children of the Abbey (1796), and Clermont (1798), to name but a few. 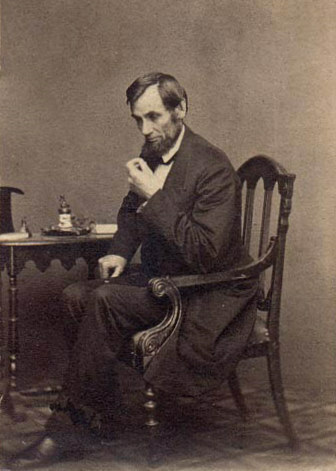 Above all, the Abraham Lincoln documentary confirmed to me the importance of querying established modes of viewing (or, not viewing, as the case may be) historical patterns, figures, events and phenomena. Such habits of perception may have been produced, in the first instance, by innovative ways of seeing and writing about the world (think of the ways in which, for instance, feminist criticism recovered a whole body of literature by female writers with the unintended but unfortunate side effect of occluding equally marginalized male authors.) Nevertheless, the work of historians and literary critics alike seems to me to be one of constant interrogation, re-figuration and revaluation, not just of historical periods, events or figures but also of the critical methods with which we evaluate them. Otherwise, we risk perpetuating myths rather than discovering truths, unpleasant as they may be. This entry was posted on 14 December 2011 at 07:30 and is filed under Film and TV, The History Profession. You can follow any responses to this entry through the RSS 2.0 feed. You can leave a response, or trackback from your own site. Brian O’Connell was pointing to the fact that certain myths, whether newly uncovered or old ones, get played up. A lot of emphasis can be place on these accounts if it can fit the slant or the opinion which the biographer has built up of it’s subject often to it’s detriment. Tomalin claimed from a 2002 translation that Dickens had met Dostoevsky but it turns out the claim may not have been true and Tomalin has now said she will omit all references to it in future editions of her book. Thanks, Lisa. I had a crazy weekend and didn’t get a chance to read Saturday’s Irish Times in full. I must go back now and read this article…. Funny thing. I had just put up on Youtube a video of Gen. de Gaulle announcing his veto of the UK application to join the EC in 1967 when I read your piece above. I was reminded of the many faces of de Gaulle over his career and also of how many subsequent French presidents have mimicked his mannerisms. Sorry I messed up the previous comment a bit. I hadn’t intended to embed the video, just include a reference to it on Youtube, hope the link below does that. Easy seeing I’m on Blogger rather than WordPress. The formats can get very confusing betimes. Not to worry, Polo! Thanks for both video and link.